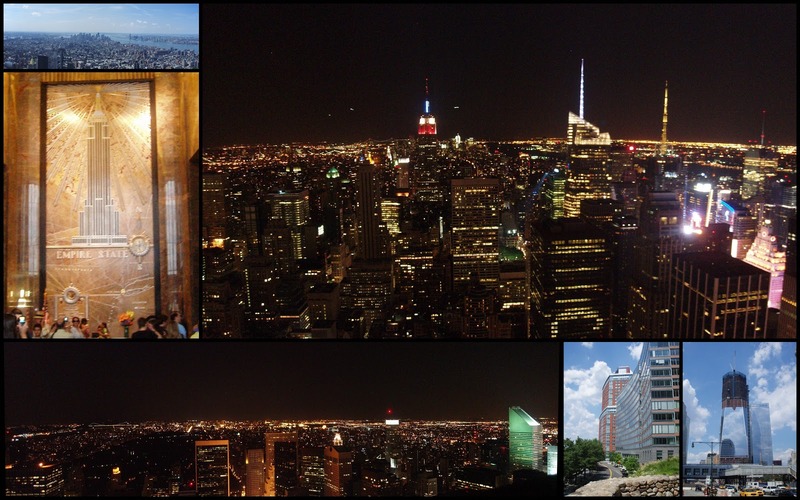 Empire State Building, World Trade Center, Battery Park, Top of the Rock… what a day! We took the subway to the Empire State Building this morning and used our CityPass tickets to go to the observation deck. (The tour guide on our bus said the extra $15 for the higher observation deck wasn’t worth it.) The CityPass ticket includes the audio tour, which is nice. You bypass the first line when you get to the building, but there are more than enough additional lines to make up for it. At the top, it was pretty crowded, but good views. It was a hazy day, however. After the Empire State Building, we took the tour bus to the World Trade Center. The new World Trade Center building is about 2/3 done. We got totally snookered by a hot dog vendor who charged us $23 for the same lunch that cost us between $6 and $8 down at Times Square. Oh well. From WTC, we walked to Battery Park, saw the bull statue near Wall Street. We navigated over to Canal Street where Diana did some inspired, nerves-of-steel haggling, and got a nice leather purse and sunglasses. We went back to our hotel before heading out for our final NYC adventure. We walked to St. Patrick’s Cathedral, then to Grand Central Station (wow! ), and back to Rockefeller Center to visit the “Top of the Rock” observatory. Top of the Rock is better run than Empire. Instead of standing in all these crazy lines, you get your ticket for a specific time. Then come back at your ticketed time. The result — fewer lines. The view is great. Instead of railing and fences like Empire, there is thick Plexiglass around the observation deck (with slits where you can stick your camera to escape the glare). Then you can head up to the second observation deck for a similar view, and finally you can go to the third observation deck which is smaller, but has now surrounding Plexiglass. And as they say, the view from Top of the Rock has something Empire’s view will never have: a view of the Empire State Building.